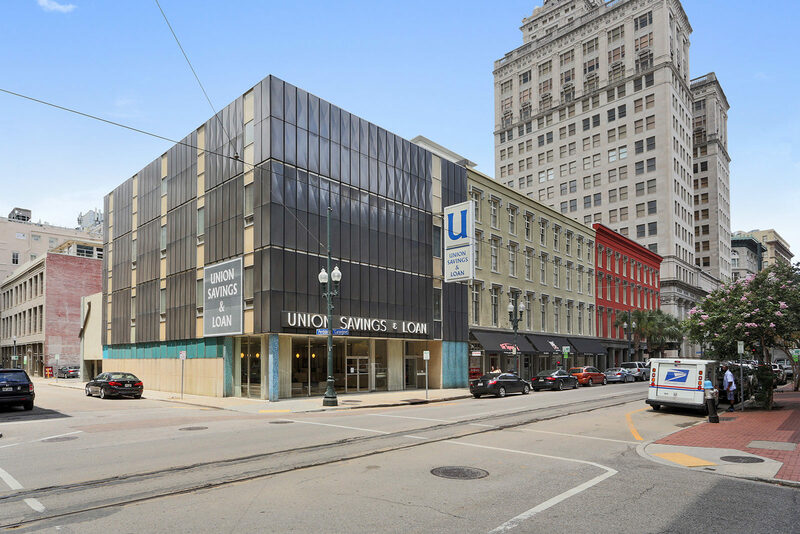 On April 5, the Union Savings & Loan building will host the REVIVAL GALA, PRC’s 42nd annual Julia Jump, filling the currently vacant space with festivity before its planned restoration begins. We hope you’ll join us for a celebration of the preservation of our historic city while experiencing art installations, live music, an open bar and hors d’oeuvres in the soon-to-be rehabilitated space. Learn more & get tickets. The building’s facade is distinctly modern, with enamel and travertine panels, blue tile mosaics and vertical strips of aluminum windows that embody the aesthetics of 1950s modernism. Hidden beneath the outer layers of the Union Savings & Loan building, however, is original building fabric that predates its exterior by another century. The Union Savings & Loan building at 353 Carondelet St. once looked identical to the other six buildings on the block. Built in 1850 and designed by Scottish-born architect George Purves, the row of eight commercial buildings was historically known as Union Row and was a prime example of the “granite stores” that once were prevalent throughout the city, explained Gabrielle Begue of MacRostie Historic Advisors in a historic tax credit application for the building prepared with the help of Trapolin-Peer Architects. Sitting atop heavy granite piers on the first floor, these brick buildings — often covered in scored stucco to resemble stone — were built in rows and lined entire city blocks throughout the Central Business District in the mid-19th century. The Union Savings & Loan Association occupied the building until 2018. The building currently sits vacant while developers RAMM Real Estate, managed by Richard and Mary Martin Roth, plan a restoration to return the structure to its 1850s appearance and reconfigure the building for retail and office space. On April 5, the public will get a rare chance to step inside this historic building before its full renovation when the PRC holds The REVIVAL Gala, the 42nd annual Julia Jump presented by Fidelity Bank and the Roth Law Firm, in the building. The building’s rear elevation retains its 19th-century appearance with wood sash windows and stucco-covered-brick walls. Upper floors retain many historic features, including wood floors, plaster and brick walls and original trim. Photos by Imoto. 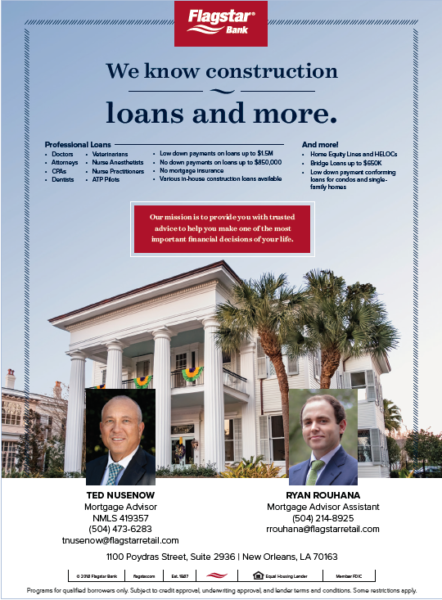 The Union Savings & Loan building has a rich history. Union Row was distinctive from the rest of the city’s granite stores because of its “unusual windows, which consist of painted-wood sashes set behind deep cruciform mullions and label lintels that add a Gothic Revival touch,” the application explains. 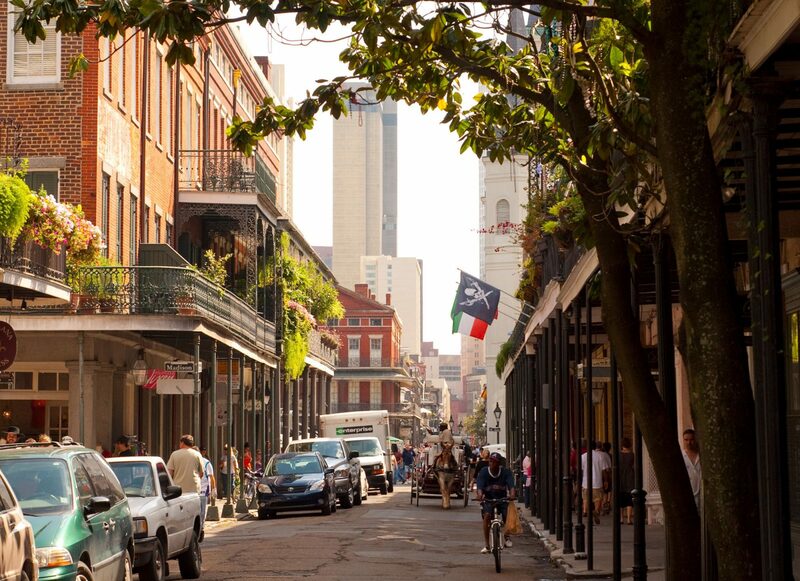 The numbers of the once-common building type have dwindled in New Orleans since its 19th-century heyday, as many were significantly altered or demolished to make way for redevelopment or street widenings. Although two of Union Row’s original eight granite stores were covered with a modernist facade in 1958, Union Row is a rare surviving example of a row of similar buildings occupying an entire city block. According to the research for the building’s historic tax credit application, the Union Homestead Association moved to the block in 1910, at the end building located at the corner of Carondelet and Perdido streets. 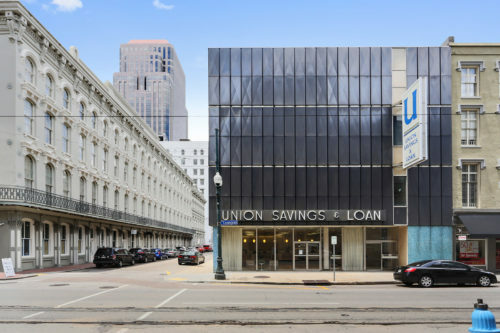 In 1958, the bank — then called the Union Savings & Loan Association — expanded into the next building and combined the two spaces by replacing the dividing brick wall with steel beams and columns. The building was then covered with its current facade — a mid-century modern slipcover designed by August Perez & Associates. 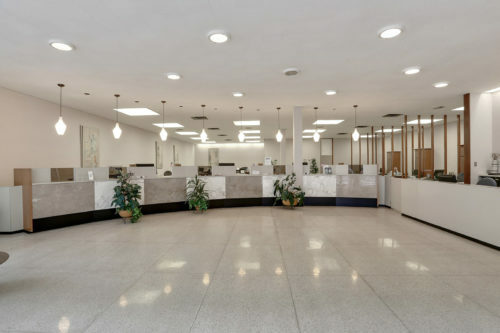 The first floor and front facade were completely remodeled in 1958, removing the granite piers at the first floor and replacing them with an aluminum and glass storefront. 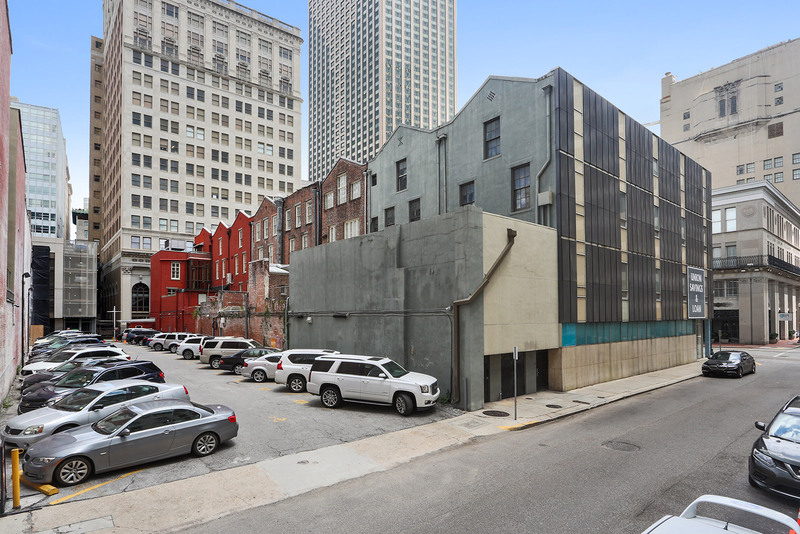 The brick facade wall along Carondelet Street was removed and replaced with steel beams and studs to accommodate the new facade. The rear elevation of the building was untouched during the 1958 renovation, though, and retains its 19th-century appearance with wood sash windows and stucco-covered-brick walls. The 1958 renovation created a modernist bank lobby on the first floor and covered the building with its current facade. Photos by Imoto. On the inside, the building’s first floor was altered in 1958 to create a modernist bank lobby with terrazzo floors, a curved marble-clad counter and an acoustic tile ceiling. 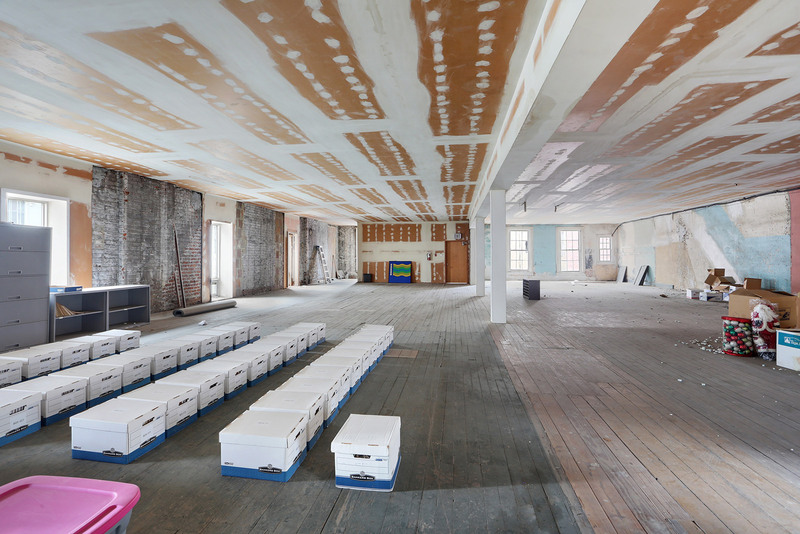 The upper floors of the four-story building were partially gutted during the renovation, and had been mostly vacant or used as storage for 60 years. The upper floors still retain many historic features, including wood floors, plaster and brick walls and original trim. Although the mid-century modern facade has its own significance — it was added to the National Register of Historic Places in 2014 when the Lower Central Business District Historic District extended its period of significance to 1964 and included several mid-century buildings — architects have found that the 61-year-old facade is having a detrimental impact on the 169-year-old building fabric beneath it. The panel system on the building’s mid-century slipcover was designed to be a rain screen, but exploratory demolitions by Trapolin-Peer Architects and Ryan Gootee General Contractors have shown that the panels have had the opposite effect. The application explains that water “gets trapped behind the panels and sits at the bases, causing corrosion of the panels and clips” that hold the system in place, leading to water and termite damage inside the building. 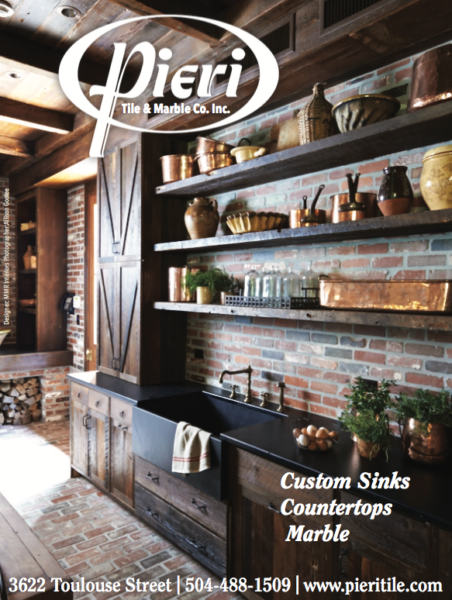 “This rusting is inevitable unless the design, connections, and materials are altered,” the application says. To restore the current modernist facade, though, the materials and design would need to be altered to fix these problems and meet current wind codes – resulting in a design that would likely not keep with the current 1958 appearance. Instead, developers hope to restore the building to its former 1850 appearance. The current historic tax credit application shows plans to remove the mid-century modern slipcover in its entirety and restore the storefront to its original look. The surviving brick walls would be repaired, and the portions removed in 1958 would be reconstructed and covered in scored stucco. New wood windows, modeled after the existing historic windows on the other Union Row buildings, would be replicated to match originals. Stucco-clad piers, matching the dimensions of the building’s original granite piers, are planned for the first floor. The 1950s finishes would be removed from the interior as well, and the historic elements on the upper floors would be restored. The project’s application still awaits approval from the State Historic Preservation Office and the National Park Service, but if the current plan is approved, the building could soon be restored to its 1850s appearance and the historic Union Row would once again line the entire city block with 19th-century granite stores.